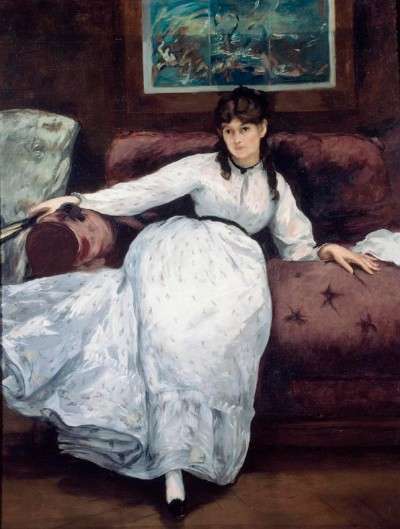 “LE REPOS”: A PORTRAIT OF BERTHE MORISOT BY ÉDOUARD MANET. At the Museum of Art, Rhode Island School of Design, Providence, RI. The Boston Phoenix, July 12, 1991. When Berthe Morisot met Édouard Manet at the Louvre in 1867, he was 36 years old and married; she was ten years younger and still living with her parents at home. She was lively, intelligent, charming, talented, soon to be the first woman artist to exhibit with the Impressionists. He was brilliant, difficult, fickle, famous as the author of Olympia and Dejeuner sur l’Herbe, almost ugly, absolutely fascinating. As Emil Zola said, “He departed for the unknown every time he placed his white canvas on the easel.” She had long admired him from a distance; he immediately wanted to paint her portrait. Manet’s 1870 painting Le Repos, permanently on view at the delightful little Museum of the Rhode Island School of Design, shows Morisot reclining on a couch, dressed in white. Elegant, exotic, and independent, Morisot always wore black or white, and soft slippers; she hated the black lace-up boots that other women wore. Above her head is a Japanese woodblock print of blue and turquoise waves that look like sea nymphs dancing in the sea — or her own restless, lyrical dreams. In Le Repos, Morisot seems almost asleep. She looks sad and dreamy; her eyes are dark and deep. Her eyes are the emotional center of the painting; everything seems spirals around the dark immensity of her gaze. Manet signed his name to Le Repos not in the traditional lower right-hand corner but inside the Japanese print that floats above Morisot’s head like an emblem of her inner life. Although he is not in the painting, you can feel his presence in the room. She sees him, and he sees her, and their seeing each other — really seeing each other — is what makes this painting so great. In 1872 Manet painted Morisot again, in a suite of four paintings, all in Paris, which show her wearing a veil, covering her face with a fan, standing, and finally in close-up, wearing a bunch of purple violets at her breast. In Berthe Morisot with a Bouquet of Violets, she is transformed. Now she is fully awake, fully alive; now there is passion — wisdom — freedom — love in her dark glittering eyes. 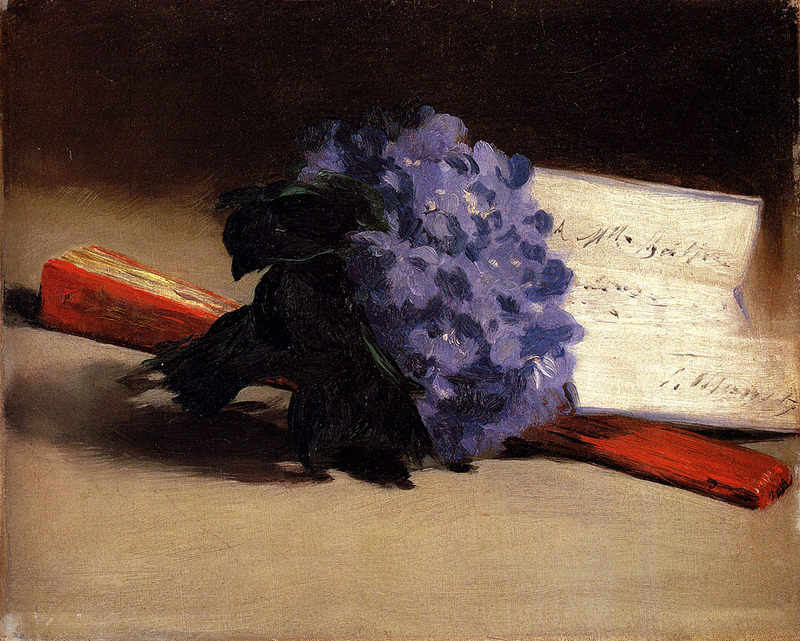 He also painted a gift for her: a still life with violets, her fan, and a scrap of paper which reads A Mlle. Berthe — E. Manet. 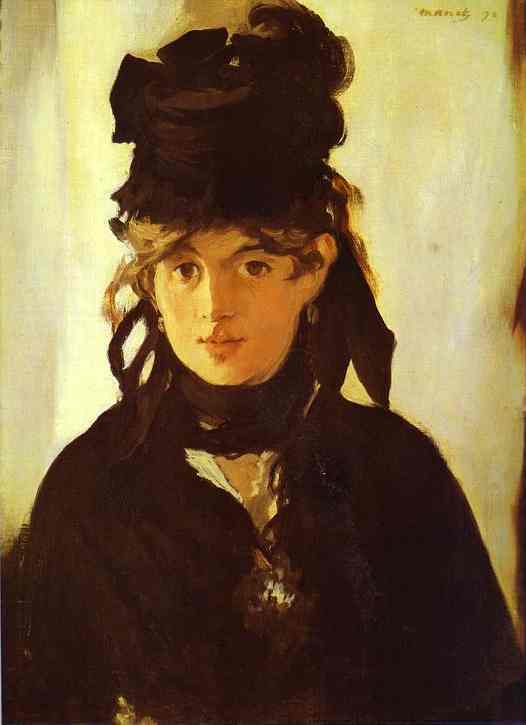 Manet moved on to other subjects, and other dark-haired, dark-eyed beauties, but he painted Morisot one more time, in 1874, just before she married his brother Eugene Manet, who had been courting her for several years. In those last paintings, also in Paris, she is dressed in black, in mourning for her father; her hair is disshevelled; her eyes are wild; and she looks tragic and luminous behind her veil. Manet and Morisot were friends from the day they met until the day he died in the Spring of 1883. Were they ever lovers? No one knows. Some art historians dismiss the question. “Convention, of course, kept them apart,” writes Anne Higonnet in her rather unimaginative recent biography Berthe Morisot. But others speculate that the little painting of violets was a lover’s gift — a memento of some blissful Paris afternoon. Were they lovers — or was it just a dream? Looking at Le Repos, you can feel the profound and passionate connection between the two artists. Here, at least, there is no life to constrain them — no death to part them. Here, at last, there is nothing and everything between Manet and Morisot. This entry was posted on Friday, July 12th, 1991 at 9:21 pm and is filed under Boston Phoenix, Favorites, Museums, Painting. You can follow any responses to this entry through the RSS 2.0 feed. You can leave a response, or trackback from your own site.